Having been at their Cheltenham Festival gig, I couldn't resist the opportunity to hear Fly - (Mark Turner- saxophones), Larry Grenadier (bass) and Jeff Ballard (drums)again, which made it twice in a week. The second occasion was on Friday evening at Kings Place. The atmosphere at Cheltenham had been special, it was an eagerly anticipated gig which had been sold out long before the day. This was different, not much more than a half-full house. This time I could really HEAR. Everything. With total clarity. In the near-perfect acoustic shell of Kings Place Hall One, with Fly using a minimal touch amplification, what one hears is taken to a different level. I also got the sense that the trio were using the hall's acoustic to full effect, trying out the impossible, giving yet more colour and shape to the line, placing phrases and pauses with even more care and accuracy than normal, allowing their skills to be tested to the full. In these acoustics, lesser musiicans might be found wanting, but these three seemed to want to leave a speacial mark on it, to create the kind of experience which leaves the listener (ok, this listener) with an indelible memory. The soft outros to some of the tunes, notably "Emergence Resurgence" were just stunning. Turner knows well how to float a line of slowly shifting long notes in ethereal subtone, fading to nothing, but here at Kings Place he, Ballard and Grenadier were testing the boundaries of silence. Maybe there's a danger here. Once you've heard music played in these ideal surroundings, it becomes harder for other gigs to live up to it. The preceding set was also something very special. Mark Turner's duo with pianist Baptiste Trotignon was a different kind of perfection. They are completely settled as a duo. Both at the top of their game, playing with poise, control, charm, delicacy, and astonishing unanimity as they walked seemingly effortlessly through fascinating changes and time signatures, while keeping a completely involving melodic narrative going . 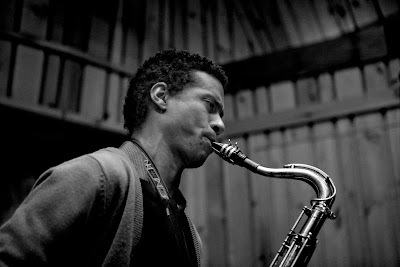 The last number, fittingly was Mark Turner's homage to Lennie Tristano, "Lennie's Groove." The possibilities emanating from the polytonal style of "Out on a Limb" are far from exhausted. Turner and Trotignon are taking that language further. Arts Council England had their logo proudly emblazoned on the Partager Festival's publicity material. ACE decided- very late in the day- that they weren't even going to give this innovative festival a minimal grant. After the large hand-outs sloshed to its favoured children I find that shameful. My first gig at King's Place and you're right, the acoustics were excellent - you could hear every note perfectly - and hear the hard work in every breath, wheeze, click of the sax keys - and it made you concentrate hard. Very comfy seats, too.